Have Questions? Call In Today! You are here: Home / Great Deals / Have Questions? Call In Today! You can hear the chat here – there are a few minutes of commercials at the beginning. 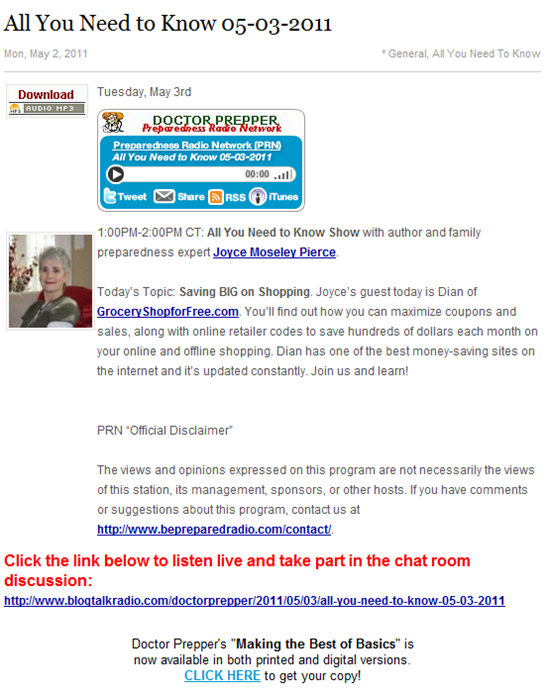 Last month I was invited to be a guest on “All You Need To Know” radio show, hosted by Joyce Pierce on Be Prepared Radio! So, today at 1 pm Central Time, I will be on the show answering questions. So, if you have time and/or any questions, feel free to join in the chat! You can hear the chat here – there are a few minutes of commercials at the beginning.